Doug's specialism is polishing personal effectiveness, getting team relationships on tip-top form and building team and individual confidence to deal with workplace pressures. Doug is an experienced workshop facilitator, coach, psychotherapist and hypnotherapist. He has been involved in personal development work since 1987. He combines an eclectic mix of evidence-based tools, with a warm, relaxed training room that allows delegates space to find their own answers. He has developed our innovative pressure management workshop, BOOST, has designed and delivered advanced communication, strategic thinking, and project management courses for a range of organisations from Charity to Finance and Accounting. For several years Doug has worked with the Fire Service running deep immersion week-long personal development training courses for active personnel across the South of England & Wales. 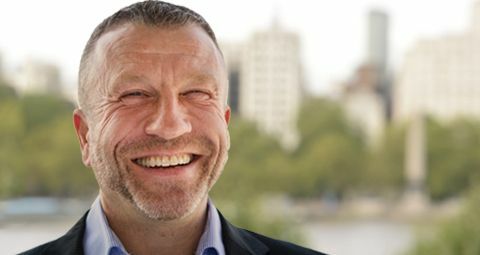 He has run Wellbeing bite-sized courses that have been broadcast all over the globe for a well known Charity. He is our go to specialist in working with high performance individuals that require a little help getting back in the saddle when things have got tough. Doug has worked with participants across the UK, Europe, Asia, Middle East and USA in English. Some of our clients he has worked with include Save The Children, Net a Porter, Everything Everywhere, Social Services, London Fire & Rescue HQ, The Royal Society and the Welsh Government. I’ve been fortunate enough to experience three quite different careers: in biochemistry for Glaxo, in the music business and now as a facilitator, coach, trainer and psychotherapist. Doug has a busy west London Psychotherapy practice. He is also a member of the BACP, the EMDR Society UK and the British Society of Clinical Hypnotherapists. Doug still loves to mix it up on his Pioneer CDJ decks (and do the odd party now and then), losing himself in his gardening on a Saturday afternoon at his allotment and having a lazy afternoon pint at the local Prince of Wales in Putney (try it, its very good!). Click here to catch Doug talking about Boost! the wellbeing course he has designed and facilitates for us. Tailored leadership development, presentation, communication skills and management training courses designed to meet your needs and budget.